The Warships larger cousins were the Westerns, marvellous locos that had far too short lives due to them being non standard. 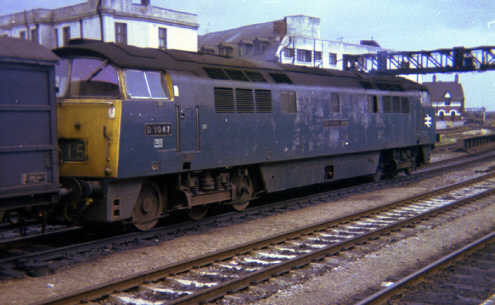 This example is D1057 Western Chieftain, seen here at Cardiff General in the last livery for this class, when it was new it bore maroon livery and was a regular on a diagram used for crew training on the type that included a Kingswear to Taunton stopper which I could get to see at Paignton after school. Photo by B Tucker. 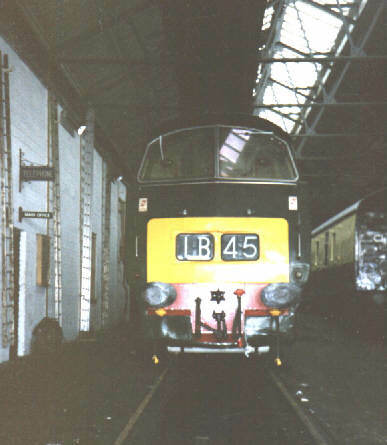 Another Western is D1054 Western Governor seen here at an open day at Bristol Bath Road depot in the company of a class 47 D1728, one of the types that supplanted the Westerns. 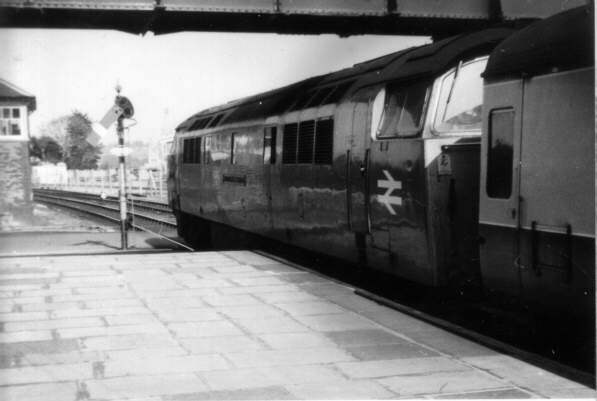 The Westerns were better performers, keeping time with the Paddington - West of England trains where the 47's were always a few minutes late into Newton Abbot despite the recovery time between Exeter and there. 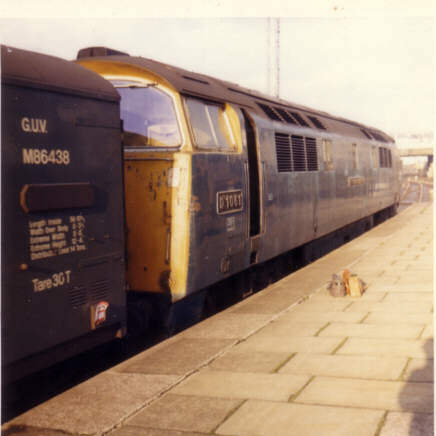 I worked for a summer at Newton Abbot station and well remember their smart getaways and the thunder of the exhaust when one started the 24 coach empty stock to Cardiff Canton at the end of a summer Saturday. Photo by B Tucker. 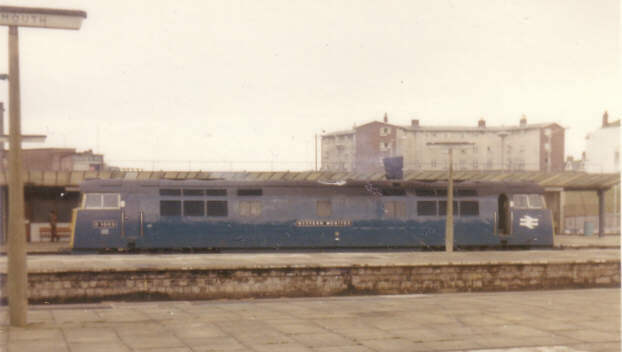 D1047 Western Lord is seen on a van train at Cardiff General. 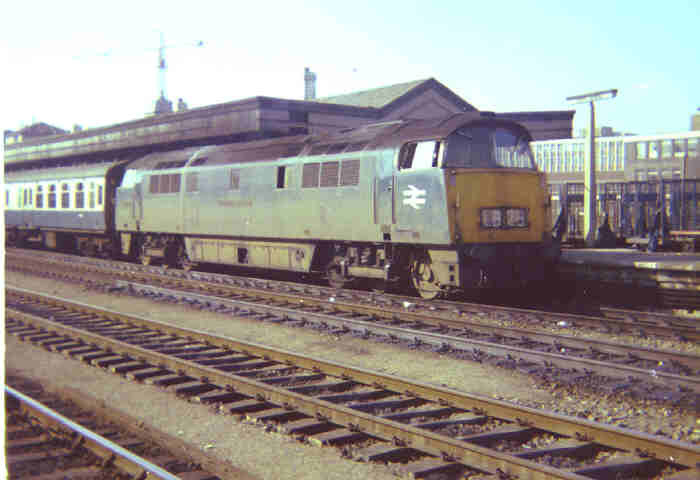 Another of Brian Tucker's photos, D1013 Western Ranger also at Cardiff. D1035 Western Yeoman is seen running in to Cardiff General with an Inter City working while a Peak (class 45 or 46) waits on the up through. Yeoman was another regular at Paignton when the class first appeared in the area. 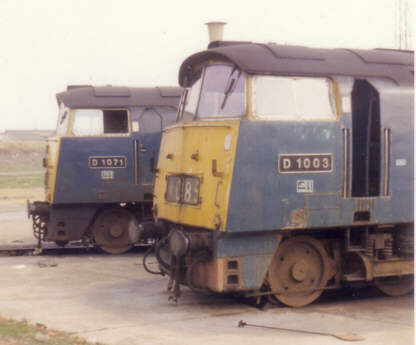 There's a couple of photos of D1010 masquerading as D1035 further down the page. 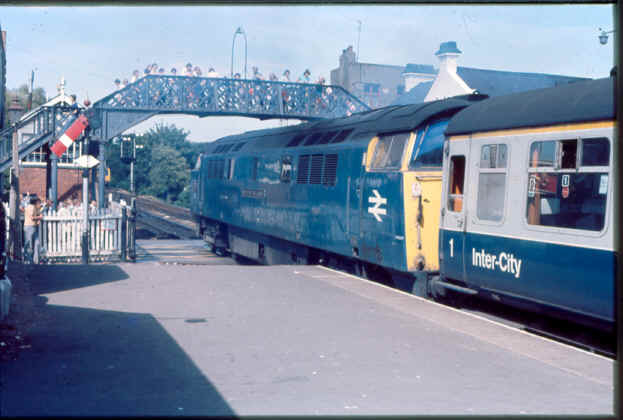 This view shows D1068 Western Reliance leaving Paignton with the 15.27 local to Newton Abbot on 4 August 1976. You can see the old semaphore signals and the gated level crossing, with Paignton North signal Box in the background. There is also a DMU just visible waiting at the down starter signal, this used to sway alarmingly when you were changing the oil lamp especially when you were out on the single arm post. Reliance was a regular at Paignton on the very first Western turns so this photo, combining as it does a loco and a location that figured large in my youthful "spotting" was a great find. 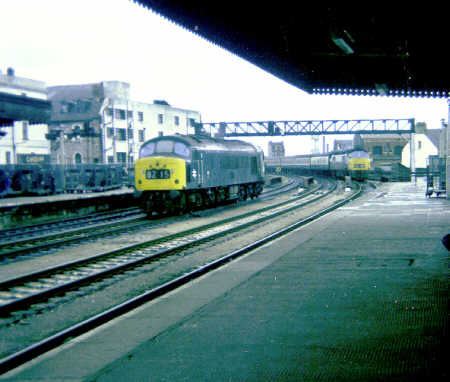 A second photo from Steve Marshall sees three Westerns stored inside the old works building at Newton Abbot on 26 August 1974. 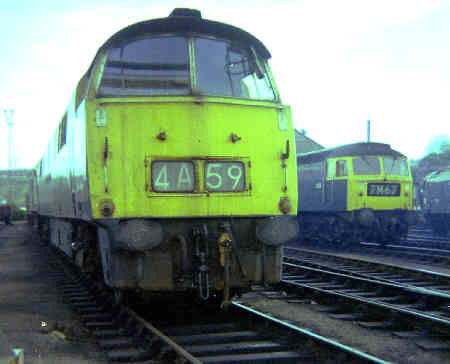 From left to right is D1051 Western Ambassador, D1062 Western Courier and D1014 Western Leviathan. 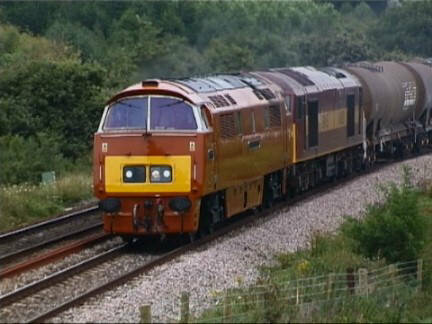 On 29 August 2002 preserved D1015 Western Champion was en route to an EWS open day at St Blazey via working 6V70, a regular freight, with 60085 dead in transit as "insurance". 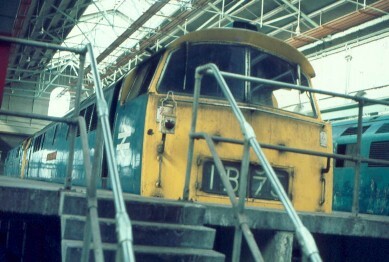 D1015 is preserved in its original golden ochre livery. 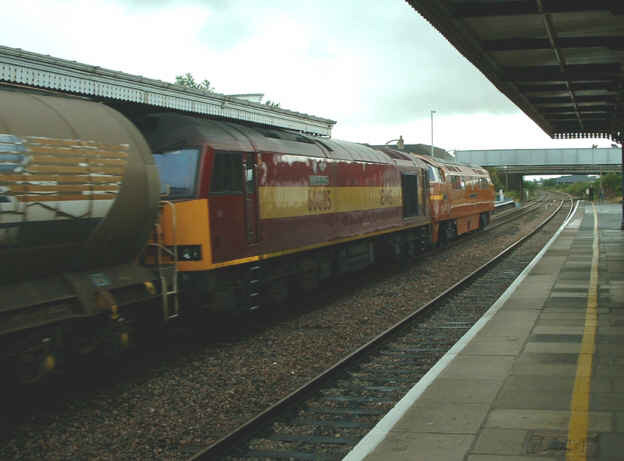 A second view of the pair as they raced through Bridgwater, only 1 minute late - which was fortunate as the 16.27 up service had just cleared the view. Further down the line Steve Marshall captured D1015 climbing Dainton Bank with 6V70. 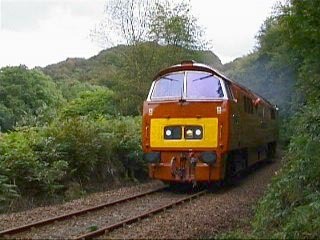 Three shots of D1015 by Steve Marshall while working service china clay freights near Lostwithiel, Goodbarrow and Luxulyan. 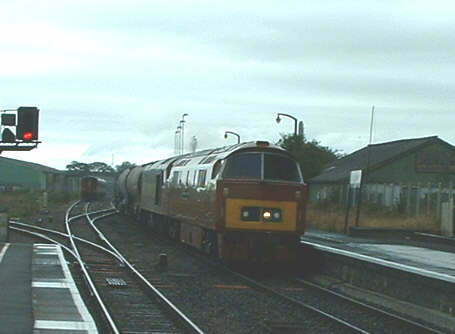 A more recent view of D1010, at Minehead in May 2003 during the WSR's Cross Country Weekend. 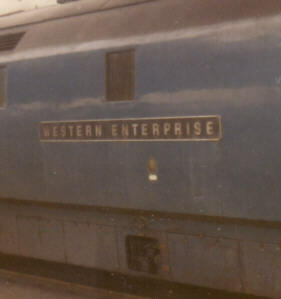 Now some photos by Glen, first of the name and number plates of D1000 Western Enterprise. 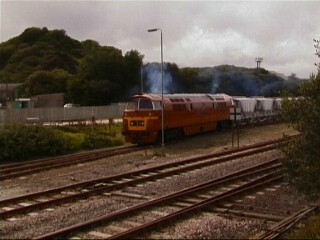 D1059 Western Empire leaving Truro. 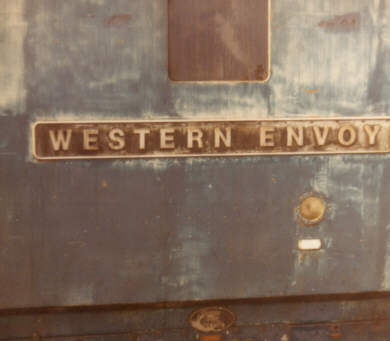 The nameplate of D1061 Western Envoy on 24 Feb. 1973 by which time she was getting very run down. 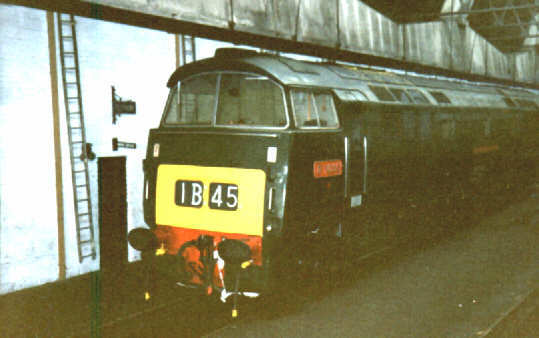 D1061 Western Envoy on a parcels train at Plymouth on the same date. 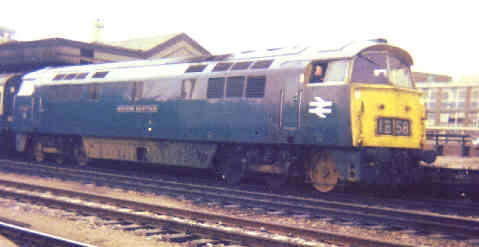 D1063 Western Monitor light engine at Plymouth also on 24 Feb. 1973. 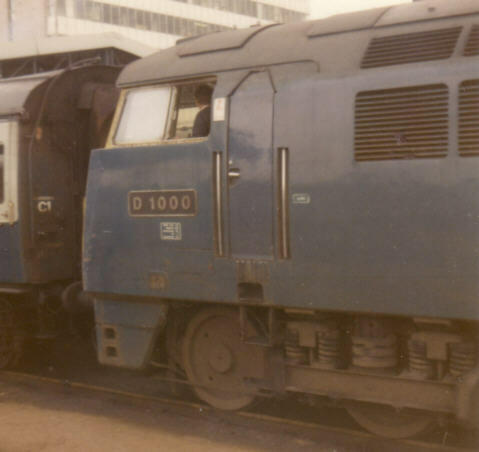 D1003 Western Pioneer and D1071 Western Renown around one of the turntables at Old Oak Common.